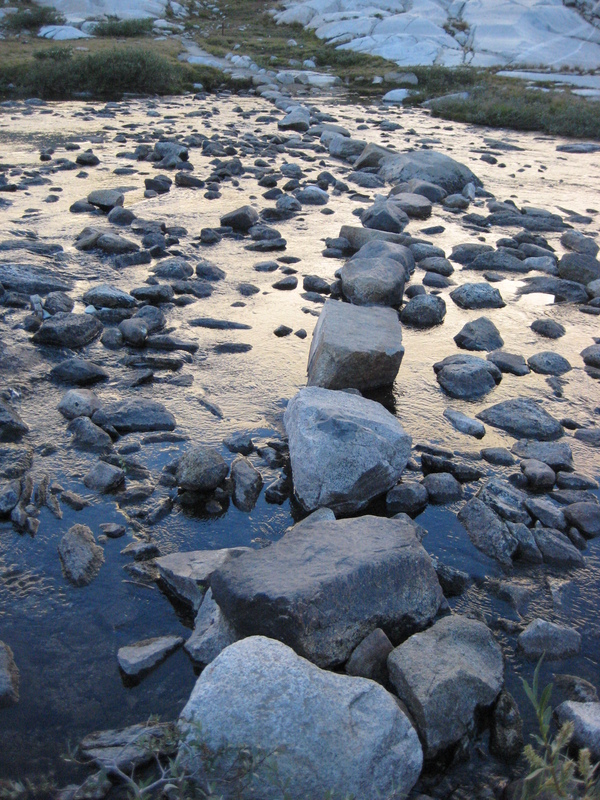 I have known, for some years now, that when I turned 50, I would hike the entire length of the John Muir Trail. I would make the trip alone, without the distraction of company and with plenty of time to walk at a pilgrim’s pace. Now, almost a year has passed since I turned 50 and so the time has come. Over the last few months, and within very small pockets of free time, I have been busying myself with trips to REI, staying up late ordering supplies online, putting together a multitude of individualized zip-locked baggies of light weight (and hopefully, somewhat satisfying) meals, and finally packing and addressing boxes to send to my four resupply locations: Tuolumne Meadows, Reds Meadows, John Muir Trail Ranch, and Onion Valley. I know, once I actually get on the trail, I will become abysmally lonely, especially on those sharp, cold nights when there is nothing but darkness between me and the infinite sky. But the mornings, I expect, will bring the promise of a new day. The nascent warmth of the early sun, the expectation of what’s around the bend, and those first steps on the trail are some of my favorite sensations. And, within days, a routine will be established and the loneliness will dissolve into an accepted quietness. 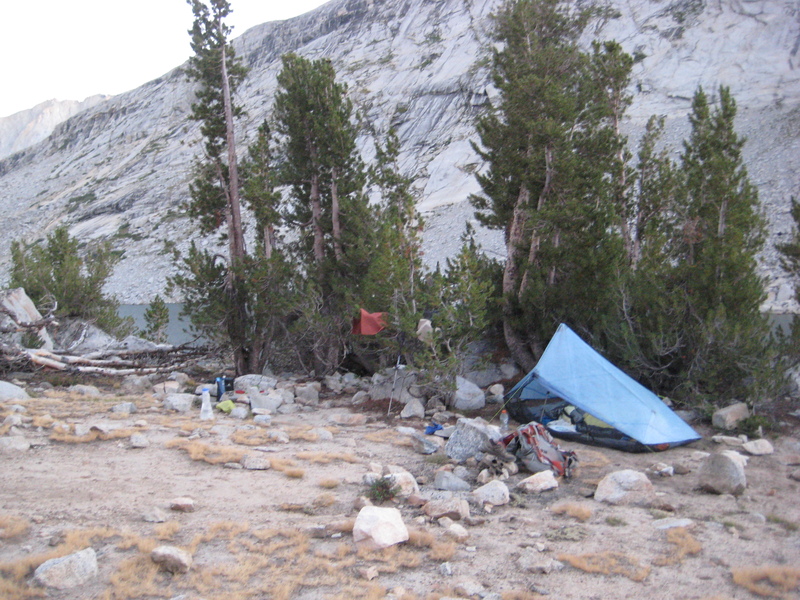 This is what I experienced during a weeklong, solo trip I made about five years ago from South Lake to North Lake. But, I’ve never been on the trail for a solid 28 days and, Lord knows, all my expectations might be dust in the wind. The only thing that is certain about walking the trail is that the cadence of each slow step, boot touching earth, is one of the most comforting sounds I know. And, as I step into my sixth decade, I’m leaving a lot behind. I am reminded of the Manly Party of 1849-50 as they made their formidable crossing through Death Valley; furniture, family heirlooms, and precious belongings scattered in the hot sand in their attempt to fulfill their dream of a better life. I know there is really no comparison between me and these outrageously bold emigrants, but in lightening my load, so that I can consciously and with the least possible resistance enter into the next phase of my life, I have also left behind some precious belongings. Already, I have left my job and status as a professor at California State University, Los Angeles. This was a job I mostly enjoyed and did well at, but felt ready to let go of. Secondly, I’ve left my home in Southern California to create a new life with Joe, the love of my life, in the forested foothills of the northern Sierra. Our new home is a beautiful place, shared by a community of generous and loving people and for this I am utterly grateful. So, at first, I didn’t expect these changes to be all that difficult, but without much warning, I’ve been thrust into a threshold of confusion. I am not quite sure anymore of who I am or what I’m expected to do. How do I make money? How do I identify myself in a new place and with new people who don’t share my history? What are my next steps? as it is, has been the one constant throughout my life. Whether I was living in Australia, Mexico, or Los Angeles, I always knew I could return to the island for friendship, familiarity, and support. 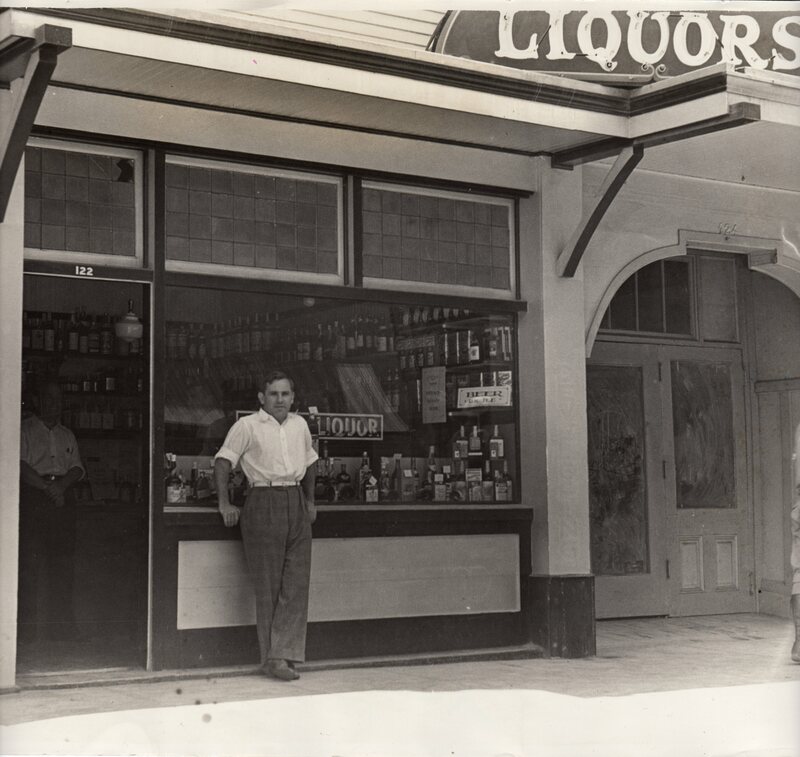 Of course, selling our property won’t prevent me form visiting the island (ugh, but even the word “visiting” implies being an outsider) but the building – referred to by the locals as the “Perluss Building” — is where I grew up, where my dad grew up, and where my bootlegging grandfather began his legitimate liquor business back in 1933 (and, coincidently, acquired the first liquor license ever issued in the state of California) . Precious belongings scattered in the sand. I guess I’m telling you all this just to make the point that it’s been a year of letting go, full of grief and confusion mixed with occasional twangs of excitement. I really can’t say for sure that I did the right thing quitting my job at CSULA, or if it’s wise to let go of the Catlaina property. I’ve made some mistakes in my life so I’m certainly not immune to making more. I am also having difficulty imagining what my future might look like. None of the scenarios that run through my mind feel totally right to me, so I’m kind of stuck here in the middle of the road. Talking with Joseph and Meredith the other night over dinner we got onto the topic of rites of passage. 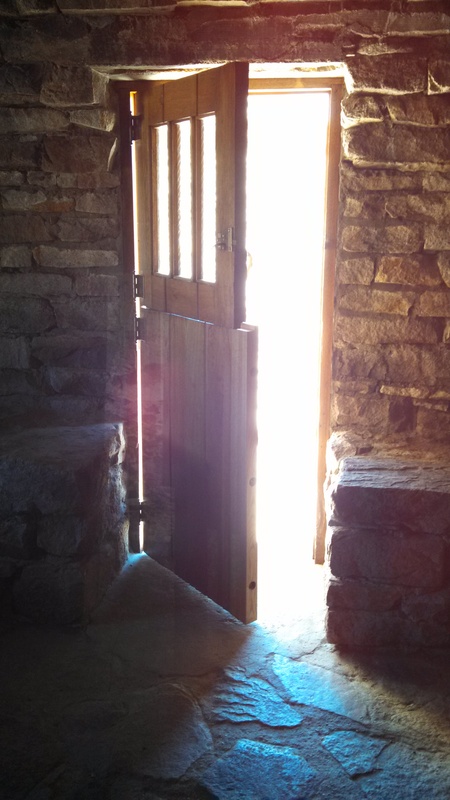 It was reassuring to hear Meredith speak of the importance of the threshold time – the in-between – of a rite of passage. She stressed the value of not rushing through the threshold, but allowing oneself to remain in this rich, but uncomfortable, state of not knowing. That there are gifts to be garnered in this place and if we rush through too quickly, they will surely be overlooked. Or, how I see it, the threshold is where the treasured unconscious content is able to manifest, slowly bringing itself to consciousness. If we opt for answers too quickly, we risk defaulting into the outworn and constricting patterns that have governed our lives. Of course, I know all this in my head, but it’s easy to miss this simple truth when actually in the soup of it. All to say, I reckon I really am in the threshold, and so I’m supposed to be confused and disoriented (“Yay”, I guess). 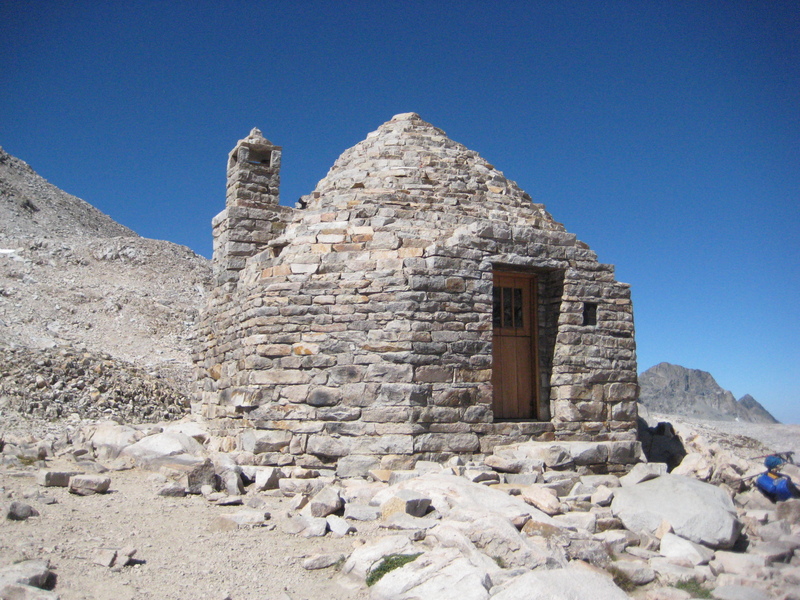 Another reason I am so glad to be hiking the JMT. When all else is a blur, walking is one sure thing I can do, and right now I feel like I could walk for forever. Walking eases my fear and calms my mind. The past and the future collapse into a pinpoint when everything depends on the ability to place one foot in front of the other. 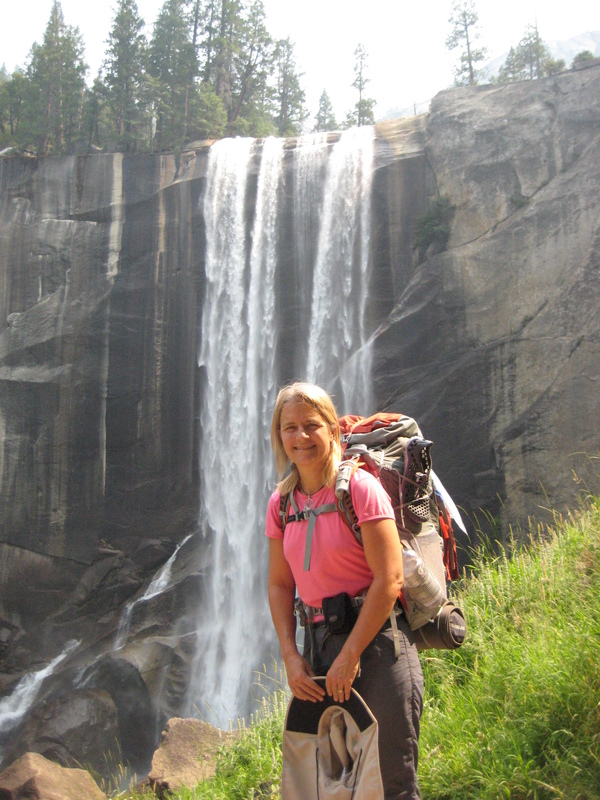 The plan is to begin my hike at Happy Isle Trail Head in Yosemite Valley and finish, 211 miles later, at Mt. Whitney. Although, I don’t normally divulge this much of myself, especially in an email, it feels important to share with you my intent and basic itinerary because I want to regard this hike as an important ceremony and thus, I value your support and prayers. You have been an integral part of my life. 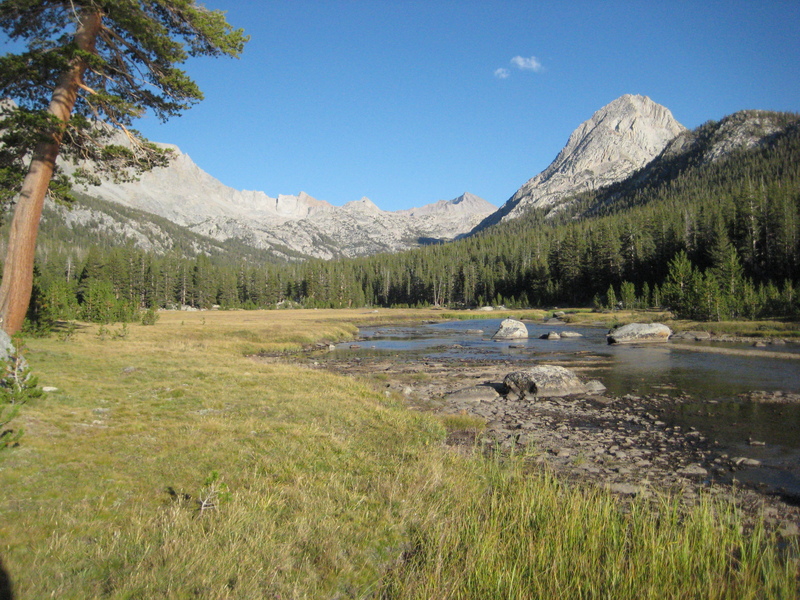 I do have layover days in Tuolumne Meadows in Yosemite, Red’s Meadow in Mammoth, and near Onion Valley at Kersarge Pass. If you wish to drop by at any of these spots, you’d be very welcomed! Below is my itinerary. Of course, these dates may change depending on my physical needs and ability to maintain mileage. My guess is that I’ll actually walk a little faster than planned and will finish on August 24th rather than the 25th. But, I wanted to give myself plenty of time to take it slow and not rush through this precious opportunity. Most of all, I want to say how grateful I am to my family and friends for supporting me so that I can take the time to make this trip. This is especially true for Joe who is making the biggest sacrifice of all, considering that I’ve been away from home so much already. With love to all of you. My quivering heart is full. July 30th & July 31st — Tuolumne Meadows. 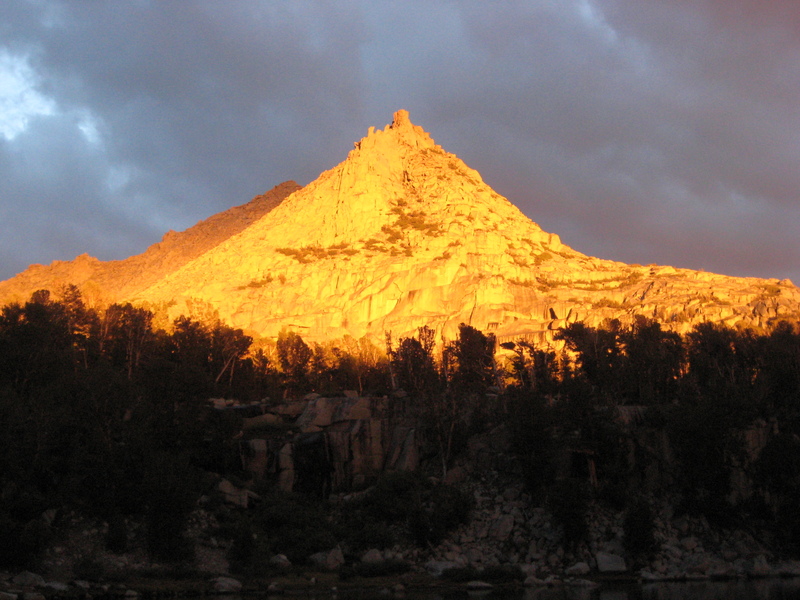 August 1st – Say goodbye to Joe (who will have hiked the first three days with me) and head up toward Lyell Canyon. 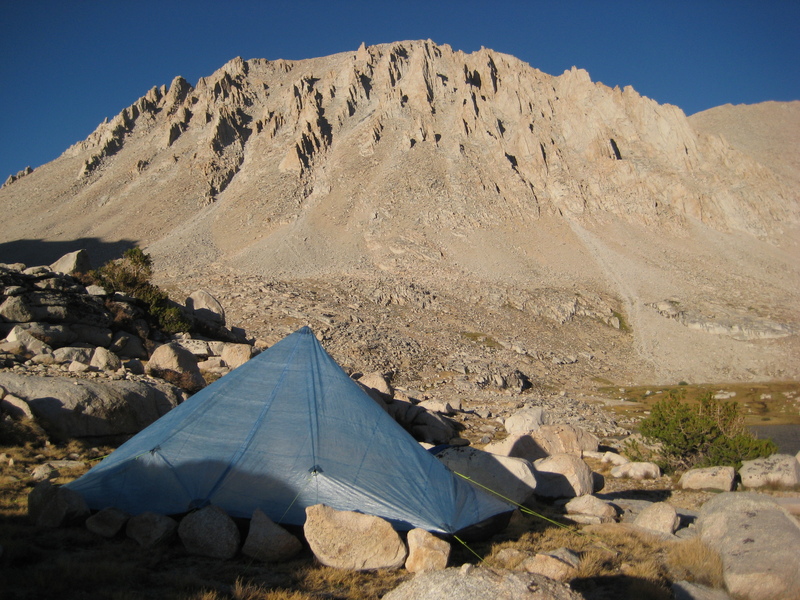 Spend the night at Lyell Canyon Forks basecamp. 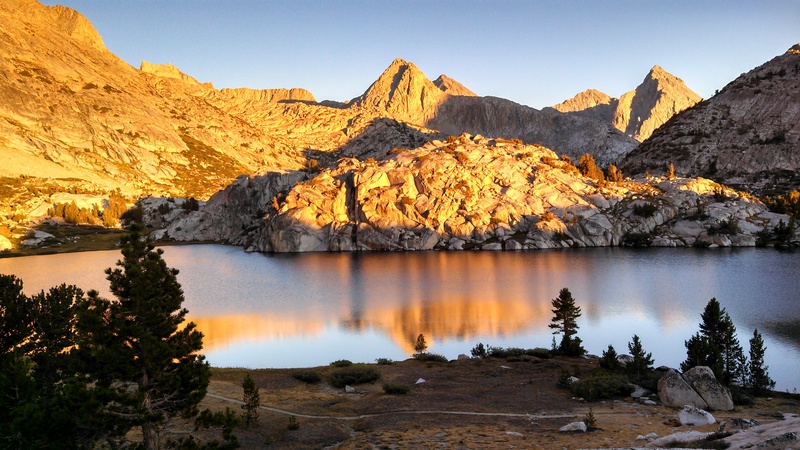 August 2nd – Thousand Island Lakes. 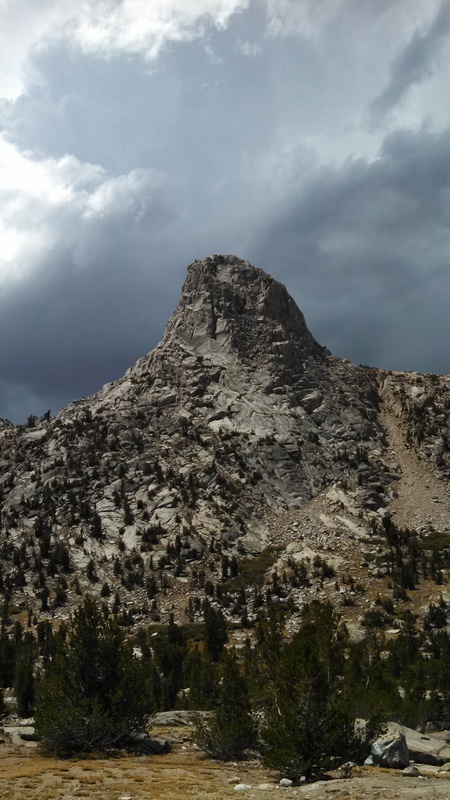 August 4th and 5th – Red’s Meadow in Mammoth (will spend the night of 5th at Red’s Meadow or in town and pick up resupply). 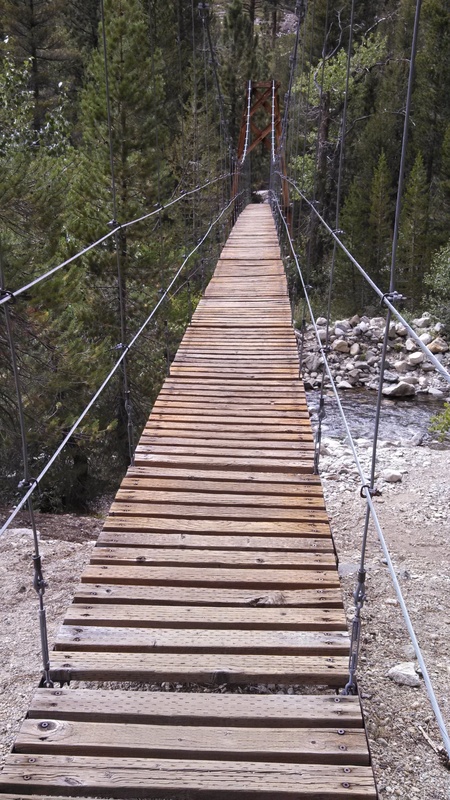 It has now been one month since I’ve completed the John Muir Trail. One month since I stood on top of Mt. Whitney, at 14505’, feeling jubilant and crazed with life, set loose like that cold morning wind that tossed my hair and whipped my face. 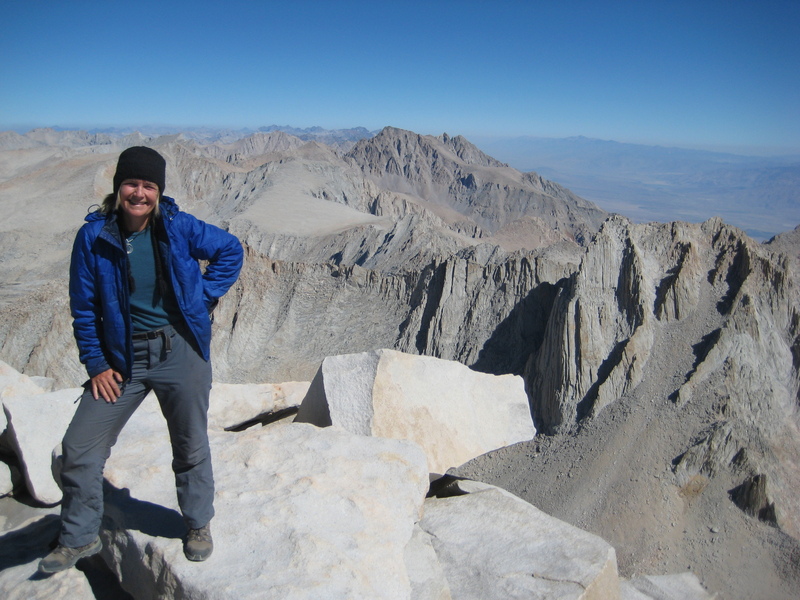 It has been one month now, since descending the highest peak in the lower 48, I walked, finally, through the Whitney Portal and put down my pack for good (or, at least until next time). After hiking 17 miles on that final day, I was altered and in a daze, but when I saw Joe walking up the trail to greet me, I knew I had made it home. And, yes, of course, even in the midst of all the laughter and kisses there was, and continues to be, an underlying thread of grief of having to leave the mountains behind. Truthfully, I could have easily turned around and gone out for another month…or two. The temptation of the never-return. I loved it. I loved it all. In retrospect, I can even appreciate that with all the snags and difficulties, the nasty blisters, and the discombobulating moments of getting lost and loosing things, it was a true ceremony. The hard times and the pain were perfectly matched by wonder and beauty: The elegant alpine flowers and crystal clear emerald-blue-green lakes, the smooth skin of the glaciated mountains, the electric alpine glow, and the almost frightening bright stars. As I walked along the trail, even when chatting with other hikers, I often thought to myself, “Treat this as if it were a dream”. And it was. As you may remember from the letter I sent out back in July, right before I began the hike I was in an uncomfortable state of transition. An in-between state of grieving what I had left behind without really knowing what I was moving toward. My intent for this hike was to honor this threshold space that could somehow hold all the scattered pieces within me, and to allow the unknown to make its way into the known in its own right time. Simply put, my intent was to walk to my heart’s content without the pressure of having to articulate myself or come to any conclusions. Nevertheless, I didn’t expect that after 28 days on the trail, I wouldn’t return with any conclusions at all. I thought that I’d come back with something to show for my time out there. And people have been asking the god-awful question, “Did you find what you were looking for?” How could I possibly find what I’m looking for when I don’t know what I’m looking for? No. There were no revelations, no earth shattering insights, and certainly no solid decisions about my future. Rather, what I found myself mostly occupied with, after days and days of walking, was not so much my future plans but the world around me. My inner world started to turn outward. I even felt a little guilty about it sometimes; counting the petals on a flower when I should have been busy solving my personal problems or making plans. But, eventually it became much more satisfying (and a lot more interesting) to focus on the little orchids by the stream than to contemplate the purpose of my life. And, I suppose that the flowers do reflect a greater meaning in their own concrete, yet mysterious way, but the meaning can’t be enforced. The simplicity of living out of a backpack, putting up a tent, packing and cleaning up camp is so refreshingly true to our human nature! As I bathed myself in the streams and rivers, I noticed the birds were doing the same. As I prepared my breakfast, I watched the birds collecting seeds from the nearby pines. A reminder that us humans are really no different from other life forms. Something slowed down in me so I could take in more of this and, for reasons I can’t fully explain, this newly felt awareness has lent itself to joy. I’m not saying that the entire trek was all fun. 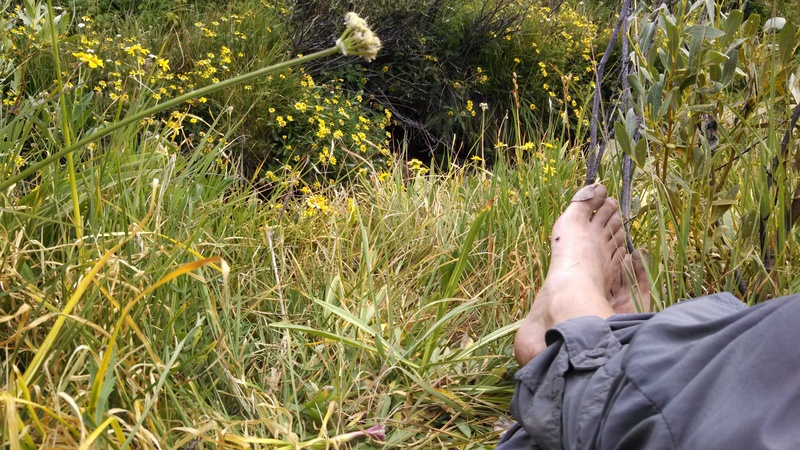 There were plenty of times when I felt angry or depressed, self-obsessed, or totally discouraged by the blisters on my feet or the cold nights when I just couldn’t get warm enough to sleep. But it is no mystery, really, that such physicality and immersion in the concrete world of things takes on a spiritual dimension (especially for intuitive types, like me, who can be so oblivious to the sensual realm). Perhaps, this is what Jung is referring to when he writes, “nature is not matter only, she is also spirit”. I think I get it now, even if just a little, that this concept of Earth-Spirit is not something that can be rationally understood. It has to be felt. Best of all, I finished the hike with a tremendous gift, which is knowing just how much I am loved. After all the days on the trail, and all the bazillion thoughts, songs, and images that played over and over in my mind, the punch line turned out to be love. 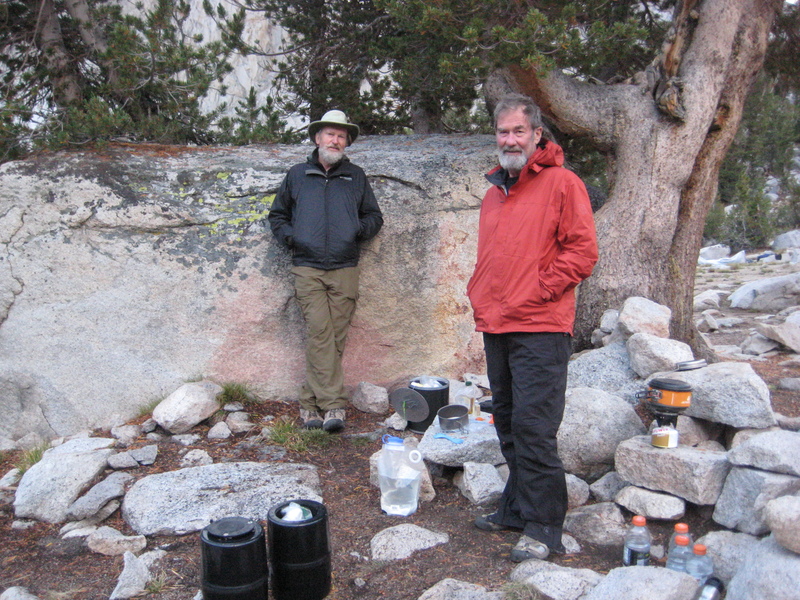 This became clear to me on day 23 when Joe, along with our dear friend Wayne, made the tremendous effort to climb the 11,760’ Kearsarge Pass to bring me a resupply that would take me through my final five days. 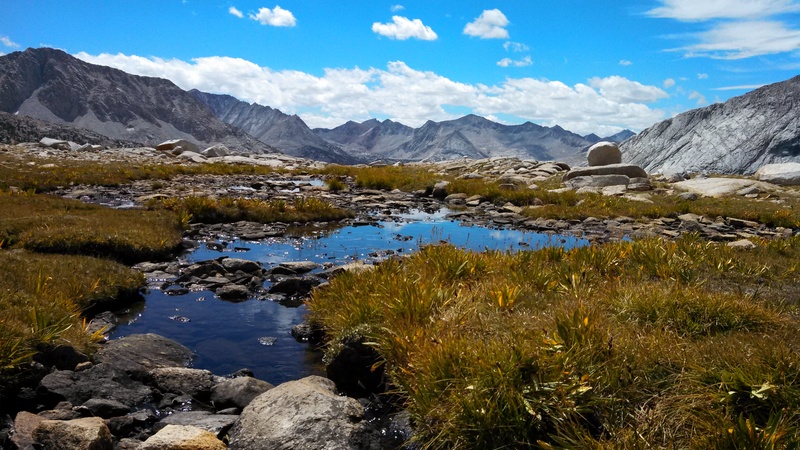 We had planned beforehand that we would meet on August 19th at the Kearsarge Lakes trailhead, but after not having any communication for nearly three weeks it seemed unlikely that our timing would match. Furthermore, the weather was stormy with lightening and thunder, offering a very small window of opportunity for anyone to get over the pass. But, as if by a miracle – and it really felt like a miracle – we met each other at the designated crossroads within thirty minutes of each other! My heart nearly leapt out of my chest when I saw those two ex-hippie looking characters, with way too large packs, gingerly walking down the very steep slope of the pass. And when they finally appeared in full form, exhausted but smiling, they pulled out gifts – a real turkey sandwich, a can of coconut water, two fresh apples, and … drum roll … a bottle of red wine! We had a feast. A love feast. And, we were awestruck. As with any true ceremony, we reached beyond the veil of our humanness and touched upon the realm of the gods. I know it sounds a bit cliché to say that it’s all about love, but even Carl Jung reminds us that there can be no meaning, no apperception of life’s great mystery, nor even the possibility of individuation without love’s intervention. Actually, it’s a pretty radical idea for our time. “Love ‘bears all things’ and ‘endures all things’ (1 Cor. 13: 7 ). These words say all there is to be said; nothing can be added to them. For we are in the deepest sense the victims and the instruments of cosmogonic ‘love.’ I put the word in quotation marks to indicate that I do not use it in its connotations of desiring, preferring, favoring, wishing, and similar feelings, but as something superior to the individual, a unified and undivided whole” (MDR, 353-4). As a victim of love, I wish to express my love and gratitude to all of you. Thank you for holding me in your thoughts, for taking the time to send your encouraging words, and for opening your heart to me so willingly. And I wish to express a special appreciation for Joe, who has a capacity for love that continues to shake me up and startle me out of my usual slumbering state. May I never again frown in the face of love.